Start your princess party off right with fabulous princess invitations perfect for any princess birthday party or other princess event. Listed below are some recommended companies offering a variety of invitations, along with other princess party supplies, decorations and party favors. Birthday Express has exclusive invitations for princess and Disney princess parties. The party packs bundle all the supplies you will need. Some items can even be personalized. Shindigz.com offers beautiful invitations and party packs, including Disney princess packs. You will find a fabulous selection of personalized banners here. And if you are trying to stretch your budget, check out the Shindigz Outlet. Birthday in a Box! is another great place to personalize your party supplies. Along with unique invitations and decorations, they have a wide-variety of party favor sets to please your guests. Below are some of the best invitations we've found. Click on any image for more information or to order. There are several options when it comes to party invitations. It is easy and quick to purchase them. Making the invitations will take a little more time, but can add a special touch to the party. We have a couple of party invitations that you are welcome to use for your party. Glass slipper invitations are fun and can be a good choice, especially if you are planning a Cinderella party. 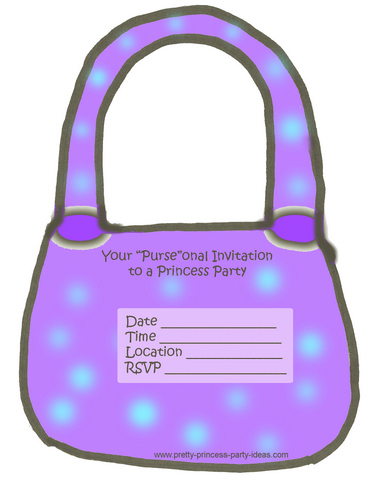 A purse invitation is also a popular idea. No princess should ever be without her fabulous purse. 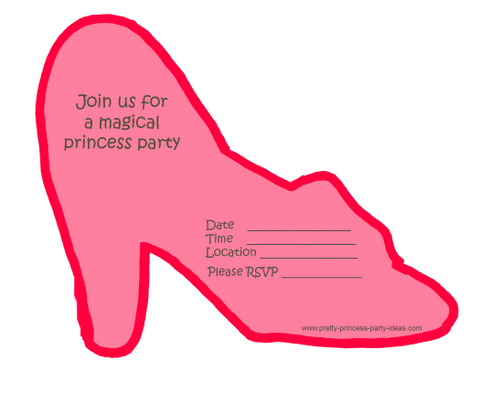 Feel free to use these princess invites for your next princess party. And don't forget to tell your friends about our website.